Low-income earners face two distinct challenges when it comes to investing in property. The first issue is having enough savings for a deposit. Their low income means it would be more difficult to build their savings each month compared to higher income earners. As a result it can often take years (and sometimes decades) for low income earners to have enough savings to qualify for a loan in the first place. A rule of thumb is that you need a minimum of 10% deposit. This is based on a 95% bank loan with capitalised lenders mortgage insurance (LMI). Capitalising the LMI means you’re adding the premium to the total loan amount. A 95% loan to value is a tough loan to find in this climate. The second issue they often face is borrowing capacity. The lenders will factor in the serviceability of the proposed loan. If a low income earner is not able to show enough surplus cash at the end of each month, the lender will not be offering a loan on a property which has a negative cash flow. And due to lender buffer requirements, even some slightly positive cash flow properties will not entice the banks to loan. The borrower needs to demonstrate that they can comfortably service the loan on the property and still have some cash reserves. For the purpose of this Game Plan, I’ve targeted two types of investment strategies; a metro strategy and a regional strategy. The key differences for both Mia and Lily are price and deposit size. 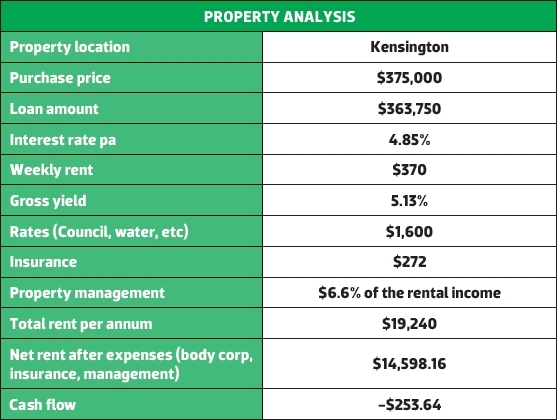 The returns on each property (in percentage gross yield) are comparable; however, one of the borrowers was able to purchase the metro property (at the higher purchase price) because she had the assistance of her parents. For those purchasers whose parents can’t or won’t assist financially, they are restricted to lower entry price properties showing enough rental yields to enable them to qualify for the loan in the first place. Find a great investment broker who can workshop scenarios with you and help you understand what you can target, what sorts of returns you need to get, and which loan is going to work for you. Consider making a short-term sacrifice to help bolster your savings. These include: house sharing, making your food as opposed to buying out, living with parents, taking on a second job on weekends. While sacrifices can be tough, the rewards an investor can reap by entering the property ladder early are surprisingly exciting. The first step for Mia is to establish her cost of living. This can be done by tracking her spending and how much money is left at the end of each month. 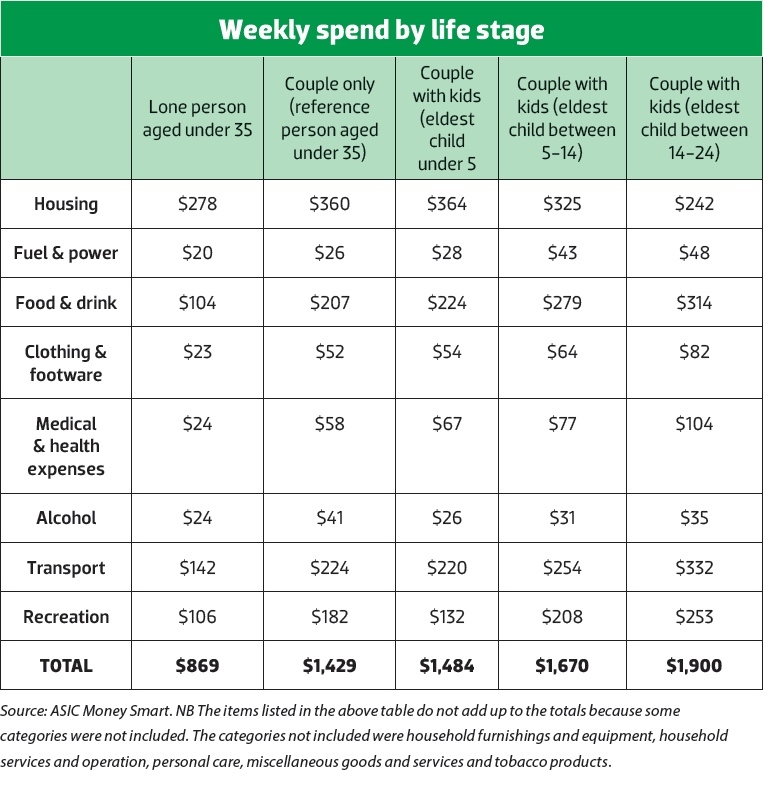 The table below shows a modest breakdown of weekly spending according to ASIC Money Smart website. The total annual cost of living for a single person under 35 according to this table is $45,188 which exceeds Mia’s income by $188 per year. However, Mia has been able to reduce her weekly rental payments to just $160 by splitting the rent on her two-bedroom apartment with her friend. This has reduced Mia’s expenses to around $39,000 per year. This leaves her enough buffers to realistically purchase a slightly cash flow-negative property as her first investment property. For any starting-out investor, the first property is usually the toughest. Without a pool of savings of at least 10% of the desired purchase price, the investor has to rely on their ability to save, or they need to explore options such as parental guarantees to get started. In Mia’s case, she is fortunate enough to have parental support. Her parents are not able to ‘gift’ her money, however they do fully own their home and they are prepared to assist her with their own equity in her home by providing her with a 20% security offer. This type of lending is also known as security guarantor loan. Mia has $30,000 in savings which she has chosen to use to contribute towards the stamp duty costs and a maintenance buffer. For Mia, the best strategy is to buy a combination of growth and strong rental yield around the 5% mark. A good place to start is to look near capital cities and in this case, Kensington in Melbourne’s inner northwest fits the bill. Kensington is a fascinating little suburb which is home to around 10,000 people. It’s in high demand among the younger demographics as evidenced by its low median age of just 32. It’s close to the Melbourne CBD at just 4km away, but far enough to avoid the oversupply problem happening in the CBD area. It’s got good public transport access including two train stations as well as a broad range of dining and entertainment options. Kensington also offers some of the highest rental returns for inner ring suburbs in Melbourne at around 4.6% gross rental yield. For the purpose of our analysis, let’s take this property located in the heart of Kensington on Eastwood Street as a possible first property purchase for Mia. The sale price in November 2014 was $375,000 and let to a tenant on settlement day in December 2014 for $370 per week. The property was renovated inside so Mia could explore the viability of a depreciation schedule. This will significantly improve her cash flow position once the tax deductions are taken into consideration. For this property, Mia will have to borrow $363,750 at 4.85% interest rate. Instead of using her $30,000 savings to pay for entry costs, she will add it to the total loan and use her savings to offset the loan. Based on actual outgoings, her ‘out of pocket’ expenses before tax benefits are roughly $250 per month. Mia’s opportunity to continue investing hinges on her investment property’s capital growth. She doesn’t have a strong cash flow so she needs to be conservative with her expenses and ensures that she keeps her savings in the offset account. All her incomes need to be directed into the offset account and she needs to continue building up her savings to cushion her position in the event of unexpected expenses such as maintenance or vacancy period. Lily’s living expenses are drastically lower because she’s living with her parents so she doesn’t have to pay rent. However, she does contribute $100 per week on board. This brings her annual living expenses to $39,988 based on the ASIC Money Smart calculation. 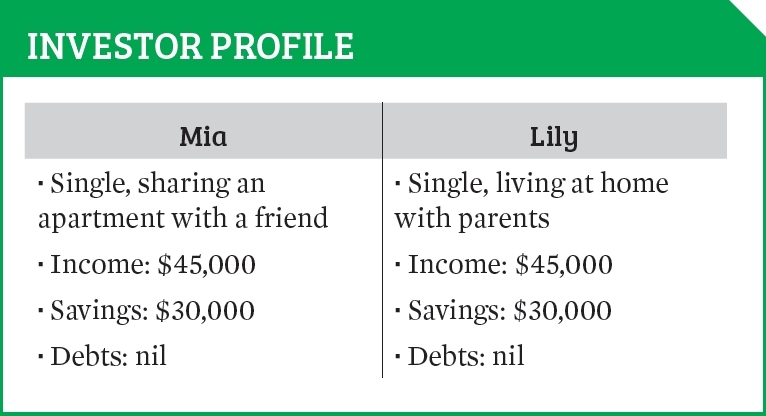 In Lily’s case, her parents are not going to assist her with a parental loan or any guarantor arrangement; however, they are happy for Lily to continue paying $100pw in board while she starts her own investing journey. A good suburb to start with is Brown Hill, a friendly suburb with a collection of good schools and just 5km from Ballarat CBD. It’s a popular suburb for those who wish for a bigger block; or a subdivision project within easy drive of the city. Brown Hill has enjoyed some moderate yet consistent capital growth of late. Investors flock to the area for the strong rental yields and home buyers who value larger blocks than what the inner suburbs offer have benefited. An example of a property that would suit Lily is this house in Richie St in Brown Hill, which is a freestanding, own-street-frontage, original 80’s house with a subdivided backyard. It was secured for $205,000 in November 2014. 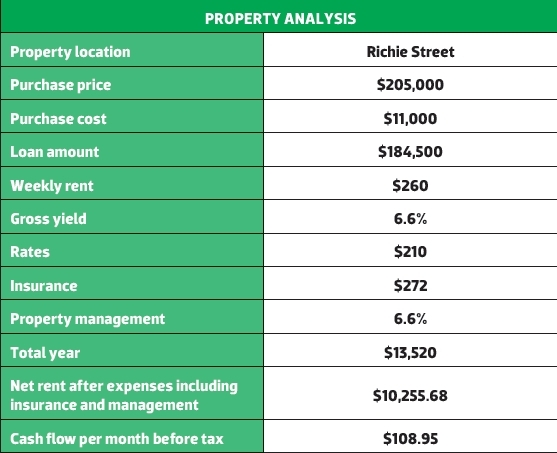 The independently appraised rental value is $260 per week, which is a fair rental for a three-bedroom house in this area. This property will respond well to a cosmetic renovation, including new carpets, curtains, a repaint, new kitchen bench tops, handles, tap ware and light fittings. Lily will need to do much of the work herself but she will need to allocate around $5,000 renovation budget to enable her to lift the internal appearance of the property and appeal to local tenants who are likely to be either contract workers, young families or local professional couples. With this reno, she might be able to raise rent by another $10-15 per week. Lily’s remaining buffer after reno is a modest $4,000, however this property works out to be cash-flow positive. She needs to funnel all of her rents and income into her offset account to slowly build her buffer account up. If Lily can get early access prior to settlement as part of the negotiated terms, she can get appropriate insurance on the property including public liability and start her cosmetic renovation to finish in time for settlement. She can also try and negotiate with the vendor to also advertise the property online for rental two weeks prior to settlement, and to allow her property manager to bring prospective tenants through in this time. Clever ways of negotiating more than just price can enhance an investor’s chances of finding a good tenant and securing a lease with them on, or close to, settlement day. Lily’s property won’t grow at the same rate as Mia’s, but Lily will be able to continue building her savings while living with her parents. Her opportunities to continue investing will hinge on her ability to save and her property’s more modest equity growth over time. Disclaimer: This article is for general information only and should not be taken as financial advice. Before making any investment decisions, be sure to get advice from a qualified professional person.